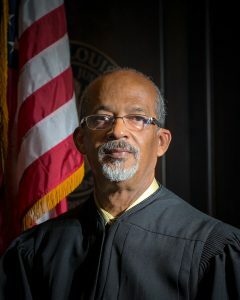 Judge Curtis Sigur is a 1975 graduate of Franklin Senior High School and a 1979 graduate of the University of Southwestern Louisiana (since renamed University of Louisiana in Lafayette) where he earned a Bachelor’s Degree of Science with honors in Pre-Law and a minor in Economics. He is a 1984 graduate of Southern University School of Law where he earned his Juris Doctorate’s Degree. In 1984 he took an oath to practice law by the Louisiana Supreme Court. Judge Sigur served thirty-two (32) years dedicated to the legal field. He served as a Social Security Staff Attorney for Acadiana Legal Service Corporation in Lafayette, Louisiana. He became an associate attorney with the Law Firm of Porter and Fuselier of New Iberia, Louisiana. Thereafter, he established the partnership of Fuselier and Sigur. In addition, he served as a Staff Attorney with the St. Mary Parish Public Defender’s Office. In 1995, he was appointed as Assistant District Attorney by the former District Attorney, Bernard E Boudreaux, Jr. and re-appointed by the former District Attorney, J. Phil Haney. He served as an Assistant District Attorney for twenty (20) years. As an Assistant District Attorney, he served as Legal Advisor for the St. Mary Parish School Board. He also prosecuted felonies, misdemeanors, child support, drug court, juvenile, and cases involving elderly abuse. He was elected to the 16th Judicial District as Judge of Division “G” in 2014. Judge Sigur’s current docket includes: Civil Trials, Criminal Trials, Drug Court, and Children In Need Of Care (CINC) cases. He is privileged and honored to have the opportunity to continue to serve our community. His lifelong passion is diligently working with others in his legal capacity and helping others understand and respect the many facets of the law.